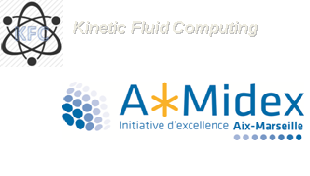 The project “Kinetic-fluid computing in magnetized fusion plasmas. Application to ITER” (KFC projectmana) has been recently granted by the Aix-Marseille University foundation AMIDEX in the frame of the Initiative d’Excellence of the French government. It is managed by M2P2 and gathers researchers from IRFM, Ecole Centrale Marseille and from three other laboratories of the University (CPT (Centre de Physique Théorique), I2M (Institut de Mathématiques de Marseille), and PIIM (Physique des Interactions Ioniques et Moléculaires)). The project is funded for two years (2015-2016) in the amount of 499 keuros. This project is concerned by the new generation of numerical tools developed between AMU and IRFM and more particularly on all the aspects around the fluid/kinetic coupling to get a more accurate description of tokamak plasmas. This requires an interdisciplinary approach between physics, mathematics and computing sciences. In the framework of the French research federation on magnetic fusion energy (FR-FCM, http://fr-fcm.fr/), this project combines all these skills in order to push the capabilities of numerical simulations of plasma dynamics to a superior level. The perspective of ITER, currently being built in Cadarache (south France), and within a shorter time frame, the setting up of an ITER-like full tungsten divertor in the Tore Supra tokamak at the CEA-Cadarache (WEST project, http://west.cea.fr/en/index.php), convey strong signals to both Aix-Marseilles University (AMU) and the Institut de Recherche sur la Fusion Magnétique at CEA (IRFM) to move one step forward and intensify their collaboration in research on magnetized fusion plasmas. The present project that gathers researchers from IRFM, Ecole Centrale Marseille and from four laboratories of the University (CPT (Centre de Physique Théorique), I2M (Institut de Mathématiques de Marseille), M2P2 (Modélisation, Mécanique et Procédés Propres), and PIIM (Physique des Interactions Ioniques et Moléculaires)) can be a strong asset of this dynamics. It aspires not only to sustain but also develop and integrate further the modelling and simulations efforts carried out by the researchers in order to remain at the forefronts of international community. We are interested by two of the most crucial issues regarding on the performance of future magnetic confinement fusion devices are the control of heat and particle fluxes on the divertor targets and the quality of plasma confinement in the reactor. This calls for an improvement of our capability to predict both turbulent and magnetohydrodynamic (MHD) transport. We will focus during these two years on specific problems raised by coupling fluid and kinetic effects in the descriptions of the plasma. We will investigate the integration of fluid closures and kinetic ingredients in the new generation of numerical tools developed between AMU and IRFM. These codes solve conservative equations related to complementary models of increasing complexity, and allow to address most of the aspect of turbulent and MHD transport both in the core and in the edge of tokamaks. Neutral physics and the dynamics of fast and energetic particles will form the associated physics. This work will be associated to a strong High Performance Computing (HPC) effort based on the exploration of original numerical methods and hardware, and focused on the AMU computing Centre equip@meso. The link with measurements interpretation on further diagnostics implemented on WEST will be also investigated.